This is Part 21 of a serial blog originally titled 'Martha Carter's Healing Journey'. In Part 20, I dive deeper into the subject of pain and share my recent research and explorations in Somatics as a healing solution. In Part 19, I explore various types and degrees of pain and the intertwined nature of physical and emotional pain, ultimately suggesting a wide range of options to explore for solutions. Missed the earlier posts? Read Part 1, Part 2, Part 3, Part 4, Part 5, Part 6, Part 7, Part 8, Part 9, Part 10, Part 11, Part 12, Part 13, Part 14, Part 15, Part 16, Part 17 and Part 18. That made me laugh out loud, as she is already more health-conscious and active than most people half her age - she does weekly pilates, senior’s exercise, regular massage, a yearly yoga retreat, walking, swimming, and more! Nevertheless, it got me thinking there is always more we can do for ourselves. I like to think we have a self-care ‘door’ that is open to all of us - whenever we are ready to try something new for our health and wellness. But wait. There are thousands of doors! So many choices! So little time! So expensive! So hard to do on my own! So, like my mother asked… what to try next? And, importantly, how to choose? Hmmm. WHICH approach do I WANT to try? (ie: a product? a technique? a class? a recommended specialist?). WHAT is accessible, available, affordable to me? Determine what is possible for you. (ie: there is no point in choosing something for ‘healing’ that causes stress in other ways!). HOW do I make it work for me? Determine how to best integrate what you want to add into your life. (ie: realistic schedule and personal expectations). For people who experience discomfort from scoliosis - or any chronic pain for that matter - looking after ourselves can be a full time job! Relaxation - baths, breathing, meditation, restorative yoga, etc. Focused exercises - yoga or pilates for scoliosis (or another scoliosis-based program). Lifestyle adjustments - paying attention to day-to-day habits - type of bed, chair, nutrition, etc. Supportive Care - massage, acupuncture, trauma release, counseling, etc. (Note: most of the above you can learn to do by yourself, except Supportive Care is usually provided by someone else). As most readers know, I am constantly keeping my eyes, ears, and body open to new studies, techniques, and products to help me manage the ongoing discomfort with my curve and my twisted and fused spine (and body! ), as well as with all the associated issues that have appeared and evolved over the years. Thankfully, I am continually surprised and delighted at how many helpful things there are to discover and experience. So in the spirit of New Year’s 2019 resolutions, I encourage you to try some new things. And to nudge you along, here is a list of my most favourite self-care elements that I am working to incorporate into my life regularly - in no particular order - that encompass the above. I hope you will take what resonates for you - and enjoy! Find a place in your home where you can comfortably lie on the floor (ideally on a yoga mat). Note: for people with scoliosis, just lying flat and ‘straight’ can already be a dramatic gesture. Use padding under your concavities, knees, or head - wherever it is needed. (count your inhale and exhale to slow down as much as possible - this is harder than it sounds, so be easy on yourself!). If you are in the mood, continue with some stretches or other familiar exercises. Soaking in hot water helps to relax sore muscles and joints. Bathing can be done to re-energize the whole body, or it can be used to relax before bed for better sleep. Lemon water promotes hydration, it’s a good source of vitamin C, supports weight loss, improves skin quality, aids digestion, freshens breath, and helps prevent kidney stones. Any heating pad combined with light stretching can ease the pain of muscle stiffness. Heat helps increase blood flow throughout the body, helping to relieve pain and to heal injuries. Sleeping with a heating pad can also be very comforting (just best to use with a shut-off timer). For increased benefits, consider trying an infrared or Far Infrared Amethyst Mat (many choices can be found online). Diffusing essential oils promotes better sleep, boosts resilience against cold and flu, clears the lungs and supports respiratory health, hones focus and cognitive function, supports emotional health, and repels insects. As for Thieves Oil, I only learned very recently about this oil and its antibacterial, antifungal, and antiviral properties… and now I keep hearing about it all the time. Funny how that happens! Click here to learn the fascinating history and qualities of this special oil. Use beeswax wraps to preserve your fresh produce and leftovers longer! 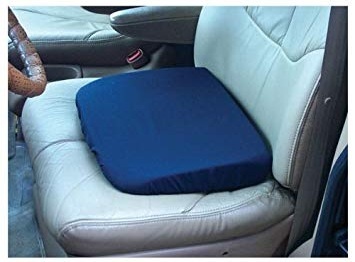 Using a wedge pillow on your car seat (or any seat) is not only extra comfy, but it also improves posture, relieves pressure on the lower back and hips, and aids in circulation. As soon as I started using walking sticks to help me walk farther with my bad knee, I started to feel stronger in my back! My physiotherapist explained that thanks to my scoliosis and fused spine, my lower back muscles (multifidus) have been weakened due to long-term atrophy. The walking sticks make me actually look forward to taking walks for the first time in years! The arm movement adds intensity to your aerobic workout, which helps to burn more calories. Sticks help you maintain proper posture, improve balance, and stability. They take up to 30% of the load off of the lower back, hips, and knees, which is especially helpful for arthritis or back problems. Cannabidiol (better known as CBD) is one of the 104 chemical compounds known as cannabinoids found in the cannabis or marijuana plant, and it is a popular natural remedy used for many common ailments. Unlike Tetrahydrocannabinol (THC), the main ingredient in marijuana, CBD is not psychoactive. This quality makes CBD an appealing option for those who are looking for relief from pain and other symptoms - without the mind-altering effects of marijuana or other pharmaceutical drugs. And now that Canada has legalized cannabis products, it is easy and relatively inexpensive to purchase a wide variety of CBD and CBD-THC products that can be very effective for pain relief, anti-inflammation, anti-anxiety, and more. As I continue to learn new ways to improve the condition of my spine and bad knees, I have learned that working on foot alignment and strength can have an extremely powerful effect on the rest of the body. Learning to isolate and move toes individually, and to widen and strengthen the whole foot can improve alignment in the whole body - but is harder than it looks! One way to work on your feet is to roll your feet over tennis balls, softballs, or spiky massage balls. 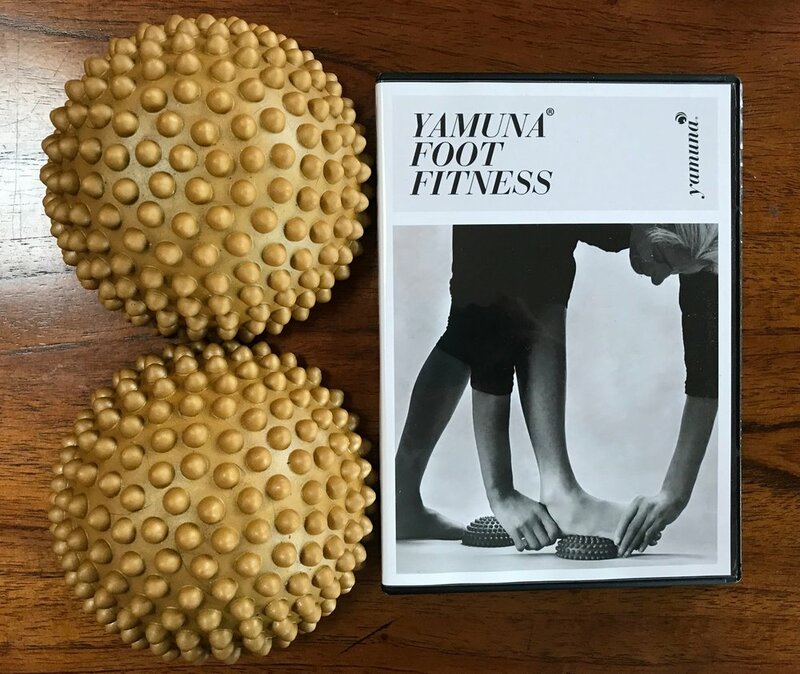 OR you can order specially-designed feet exercise ‘Yamuna’ balls, which are known to help with fallen arches, plantar fasciitis, sore feet, reflexology, bunions, hammertoes, and Morton’s neuroma. Here are some reviews of this product. Another suggestion for feet health is to use toe separators - something you may have seen people using in yoga class. Separators are usually made of soft silicone and are placed between your toes so as to help stretch and loosen the tense muscles in your toes. They are useful in providing relief from bunions, plantar fasciitis, and other types of foot pain. More info can be found here. 11. Hanna Somatics by Thomas Hanna! In my December blog, I wrote about my new exploration of this wonderfully simple, yet profound technique. Since starting classes in October 2018, followed up by two private sessions, I have started to feel the distinct benefits from practicing these exercises. I love them as an addition to all my other activities as they address my entire SOMA (or BODY) as one organism, rather than separating mind and body. Specifically, I am finally finding out how to reconnect my ‘bad leg’ to the rest of my body, finding comfort and coordination in walking and other movement patterns - and getting PAIN RELIEF! Just like my mom illustrates, it is NEVER too late. We can always feel better, and that is exactly the reason to keep exploring, trying, and discovering… and staying positive! What do you do for your scoliosis? Or for your body in general? We would love to hear your favourite self-care suggestions. Please email us at admin@twistedoutreachproject.com with ideas that we can share! Stay tuned for my next blog where I talk about the value of attending retreats - another self-care suggestion!